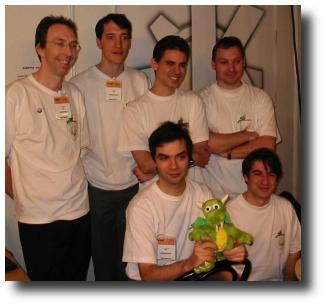 Like Linux Expo 2002, a Linux Expo is held in Paris. This year was again at the CNIT (La Defense). The name has changed to Solutions Linux because Linux Expo has gone bankrupt (I was told). Anyway, this is the same event, with the same spirit. The key to a successful exhibition is prepartion. KDE-France was quite well prepared, thank to its active members. Many ideas have been suggested to make the event more attractive and most of them have been implemented. We wanted to have projector but havn't managed to get one. So we just had my 21 monitor, which is still quite impressive. Next year, I ask my colleague who owns a plasma screen if he can lend it to us. We wanted to have some goodies to sell, to make a little money for KDE-France and to give the opportunity to people to buy something from KDE. Thank to KernelConcepts and the KDE eV, we had 16 teddy-konqui (30 euro), 20 mouse pads (10 euro) and 100 pins (2 euros). We had almost no margin on all this. We also wanted to give some flyers away. Based on the work of last year, I made a page presenting KDE, KOffice, Konqueror and KDevelop. I printed 300 of them. Gerard prepared a page presenting the KDE Edu project and its software. And we made a page presenting the Rathlix (Laurent Rathle's knoppix) and how to use it. I also wanted to make a page explaining how to contribute to KDE (translation, promotion, code, bug fixing, interviews, tutorial, ...) but for various reason, I could not find the time for that. I think we were quite ready. Gerard had some big drawers that he could close with a key, so we had a safe area. We had good tea, cups, organic sugar for our RMS tea. Gerard advised to prepare a lot of Knoppix. He said we would sell more than hundred CD per day. I was hoping to sell 30 of them but not really more. Anyway, the day before the exhibition, we had one master CD which Laurent finished a few hours ago and that's it. We managed to find two CD writers on other boothes, we could have a few master CDs. Everyone with a CD writer went home with a CD and spend the night writing Rathlix CD. We had three huge posters for KDE, which the KDE-France team has managed to print the previous year. The poster with the old fun splash screen KDE coming soon to your desktop was still cool, so we displayed it. Basically, we have covered all the walls with our stuff and it looks like the whole booth was dedicated to KDE, while we were actually sharing it with OpenOffice.org and another association. Nobody could miss us. OpenOffice had two nice looking iMac running MacOs X with a beta of OpenOffice. Apple had lent that to them, how kind! Hopefully, my 21 inch was quite noticable too. The night CD writing session was quite successful and we had something like 40 Knoppix ready. I had printed 100 copies of the page presenting the Knoppix. I thought that would be enough. Many people came to the booth. All the one that were like I don't know exactly what Linux is, I am just here to discover went away with our special Knoppix (4 euro) to try at home. Many people came for technical support (you see if I use arts and blah blah blah, it doesn't work) and I redirected to mandrake website most of the time. I was glad to hear that most people were running a Mandrake, as opposed to last year were they were mostly running a Red Hat. The Knoppix CD were selling very well. I had an appointment at noon. When I came back at three o'clock, all of my knoppix sheets had been given. This means we had sold more than 100 knoppix in the very first day. Gerard was jubilating (What did I told you, we are going to sell more than 100 a day!). The OpenOffice guys were redirecting people to our booth, for those who wanted to run a french version of OpenOffice on their computer. In the second day, David and another guy said in their conference that people could find a KDE demo CD in our booth. So we had another stream of people coming to buy CDs. I think we sold more than 250 Knoppix in the total. All these people will have opportunities to see KDE! Many people came to congratulate the KDE project, and bought a pins or a mouse pad just to support KDE. David has been demonstrating Kolab a few times to interested visitors. During the second day, there was a demonstration against EUCD. We went through the exhibition shouting Contre l'EUCD, pour le droit d'auteur! (Oppose EUCD, support copyright) and distributing some flyers. After going through the whole exhibition, we gather in a big round and somebody tied our wrists with a long rope. We then continue shouting for 5 or 10 minutes. I hope this has had an impact. At least, I heard people asking what was the EUCD, so at least it had been informative. We had less people on the third day, which was good because we were getting tired. Did I forgot something ? Yes, the RMS meeting. I have dedicated a special page for this tea party. So please go to the KDE has tea with RMS for more. I haven't spent time trough the commercial part of the exhibition. It was mostly boring. Microsoft was there, advertising for their shared source. Too bad I had not cream pie. I thought about going to Red Hat and ask for a packaged version of latest KDE but I just gave up the idea. Red Hat despise KDE for so long time now that I see no reason to make an effort toward them. I had a quick wander thourgh the other booth. Copine de geek had a nice all-pink booth and this is everything I remember from the non KDE booth. (application and documentation) - the first one being the swedish team. They also translate the releases, the dot articles, some random articles. Klaus Knopper for his Knoppix. Lot of people will discover Linux and KDE. Speka Networks: The CEO came to the exhibition with 3 CD writers and has created more than 60 Knoppix-KDE just for us. He would even bring them to our booth. The most surprising is that he does not even run KDE. The company is working in wireless security. He told me he tried to save the network (mostly down during the exhibition) by replacing the exhibition router by his. He also provided wifi coverage for the whole expo. This page was last edited on 31 March 2010, at 20:06.